While carrying out his duties as caretaker of the Connelly estate at Eighty-Third Street and Normandie Avenue, 72 year old William Nugent found a pile of ladies clothing and a partially buried female corpse. Or did he? Although summoned to the scene, police were unable to locate a dead body or discarded clothing in the sixty acre dump site on the property. Nugent claimed that he was taken into custody by two homicide detectives last week, and that the detectives grilled him for more than two hours in front of the Seventy-seventh street police station. He also said that the detectives left him with a stern admonition to keep quiet about the supposed murder so that they could find clues. John Howard, field representative for the Peace Officers Association of California, has asserted that there are no records corroborating Nugent’s claim. The cause of Nugent’s hallucinations, if indeed that is what they were, remains as mysterious as the rest of his story. It was April 12, 1924, south of the border down Mehico way, when two brigands confronted Fedosis Alvarado on his ranch near Monte Escobeda, stole $2400 and shot him dead when he tried to defend his property. Arrested for the crime, Santiago Figueroa used the victim’s money to avoid prison time. Fedosis’ daughter, Maria Alvarado Gomez, was not satified with the verdict, and when she heard her father’s killer had moved to the beach at Los Angeles, she followed, taking a home at 1508 Pennsylvania Avenue, Santa Monica. She haunted the public spaces along the shore, not in a spirit of seaside pleasure seeking, but in single-minded pursuit of the man whose face was burned into her brain. Last night, as crowds packed the streets of Venice for Fourth of July revelry, she finally saw him and cried out to her friends, "There he is, the murderer of my father, hold him, don’t let him get away!" But in Spanish, because, you know, everyone involved spoke Spanish. Traffic Officer Carter happened on the scene and took the players into custody, calling in auto camp manager Howard Wesson to translate. Once the story was explained, an envoy was dispatched to the Mexican Consulate, to determine if Figueroa was wanted in his homeland. Obviously not, since there was no follow up story on the incident. Poor Maria. Should there be a next time, may we suggest she be prepared to exact her own swift justice on her prey, and not make the mistake of trusting law or nations to supply a daughter’s long overdue justice. Over some months, while in his capacity as handyman, Kehoe stashed a huge cache of explosives inside the local elementary school. On his farm, he experimented with timers and bombs. And then finally, the great day came. This day. Kehoe beat his wife to death (you know, to spare her the shame, and so forth), tied his animals into their stalls, and set fire to his mortgaged farm. He had previously filled the back seat of his car with all the metal objects he could find, topping it off with a seasoning of dynamite. As all local fire crews raced to deal with this decoy fire, off Kehoe toddled, towards the school that he knew was about to blow. The massive explosion that racked the Bath Township elementary school around 9:45 that morning caused the entire north wing of the building to collapse, and felt like an earthquake throughout the community. Dozens of children lay dead beneath the debris, while others moaned and shrieked. Parents and firemen came running to attempt rescue. But Kehoe wasn’t finished yet. He arrived at the site of the disaster, looked upon his work for a moment, and then noticed School Superintendent Emory Huyck nearby. Kehoe crooked his finger, and as Huyck walked toward the car, Kehoe took a rifle and sent a shot into the center of the explosives in the back seat. The car exploded in a flurry of shrapnel, instantly killing Kehoe, Hyuck and several others, and further wounding many of the already-injured people on the scene. 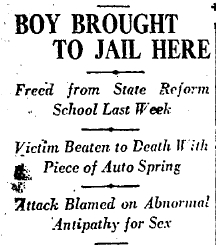 Kehoe left one cryptic message at his farm: a stenciled wooden sign reading "CRIMINALS ARE MADE, NOT BORN." The final death toll was 45. At Virginia Tech last month, 32. Something to ponder, the next time you hear the TV talking heads proclaiming Cho’s act "the worst school massacre in American history," as many did last month. For more info, see the Bath School Disaster Wikipedia entry. England has her Ripper, but in America, there is just one supreme Victorian true crime mystery: did Lizzie Borden really take an axe and apply numerous wacks to the persons of her father and stepmother… or was it the maid… a mysterious neighbor… or Bad Lizzie, who only came out when the lady was visited by Aunt Flo? Should you find yourself in Fall River, MA next August, you can explore these and other theories with fellow Borden-ologists at The Lizzie Borden Conference 2008. There’s even a call for papers, so if you have a theory of your own you’ve been polishing (much like one might sharpen a favorite axe), now’s the time to share. For more info, click here. Nice funeral today for Harry “Mile-Away” Thomas at the Gulik Funeral Parlor. A few days ago Mile-Away—the gangster known for always having been a “mile away” from whatever crime for which he was arrested—was boosting bootleg hooch and a car from the garage of Ora Lawson, 1408 West Thirty-Fifth Street. Officers responded to her call about a prowler, and when they arrived, acclaimed hijacker Thomas went for his piece. The cops opened up with a machine gun, a sawed-off shotgun and two large-caliber revolvers, and yet the twice-arrested-for-murder, “King of the Hi-Jackers” Mile-Away Thomas, filled with pounds of buckshot and slugs, ran from the garage straight at the cops. 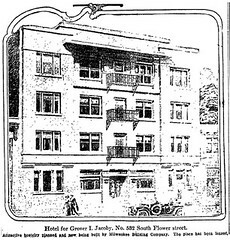 Mile-Away had been in the news just this last February, implicated in the murder of stockbroker/bootlegger Luther Green at Green’s home. Cops chased Mile-Away around Los Angeles for two weeks before arresting him and, while detectives said on the stand they were certain it was our boy, he was let go for lack of evidence. At the funeral today, upperworld and underworld hobnobbed, gawked at by the public throng, and Mile-Away’s lady friend, fellow carreer criminal Betty Carroll, swooned and collapsed for the collected. The cortege moved on to Forest Lawn, and the crowd dispersed. Think of Mile-Away, won’t you, the next time you’re down near 35th and Normandie, where his ghost, bloodied but unbowed and his clanking not with chains but from a belly full of bullets, is charging at you with final terrifying resolution, coming to hi-jack your soul. 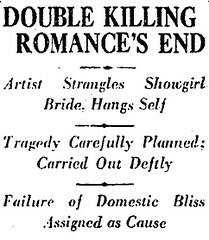 The 1924 Rentz-Rentz-Weible love triangle ended as love triangles so often do—with a corpse. When Henry Rentz, 23, got a mysterious call at the Whittier Piggly Wiggly to get himself home, he found Mrs. Rentz, 21, in bed with 18 year-old oil worker Louis Weible. As such, Rentz shot Weible in the stomach. The judge declared that Rentz “fired to protect the sanctity of his home” and exonerated the murderer. The Rentz’ put the past aside and settled back into domestic bliss. But Mrs. Rentz’ repentance was short-lived. The Rentz’ were in court again yesterday, this time for divorce proceedings, and for the second time Henry had to relate the story of Louis Weible’s slaying. Seems Myrtle Rentz, the little minx, had had a letter in her apron pocket: “Baby, I’ll see you at noon, bye-bye, love. Your Love Prof.” This was found by and was too much for Henry; he filed for divorce in short order. He got it in shorter order, up to and including custody of their daughter.